The model Ibis would never produced from 1952 and would replaced by model 140. The color black and green striped you will find very often, the other colors are very rare. This pens are from the normal production and see as different only through the engraving at the cap. 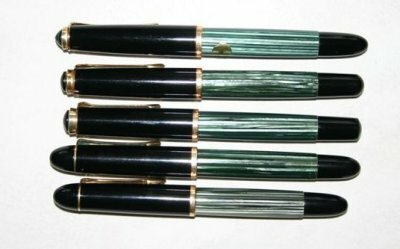 By use of a special ink this pens would used to write to punch cards and bar-code labels. Pens model 300 were only produced for export. The shape of this model is exact like the model 140, but the size is the same as the model 400. This model was produced by the manufacturer Merz and Krell by order of Guenther Wagner. This wellknown student fountain pen was launched in 1955. The re-launch kept the traditional shape. It has also the proven Pelikan piston fountain pen technology. The material of the barrel and cap is high-quality resin. Clip and cap ring are gold plated. The nib is a stainless steel nib. 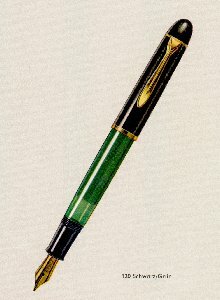 Pelikan has added a special engraving on the nib which was found in a Pelikan price list of 1889. This pen is a special edition.